ACORN members welcomed the news this week that the BC Government is reducing the maximum fee for borrowing payday loans, from $17 to $15 for every $100 borrowed. We are pleased to see the government take leadership on this important issue that impacts low and moderate income British Columbians. Tougher regulations will increase protections for vulnerable consumers and are long overdue. “This is a good step towards tackling the predatory lenders that take advantage of low and moderate income people who have no alternative. 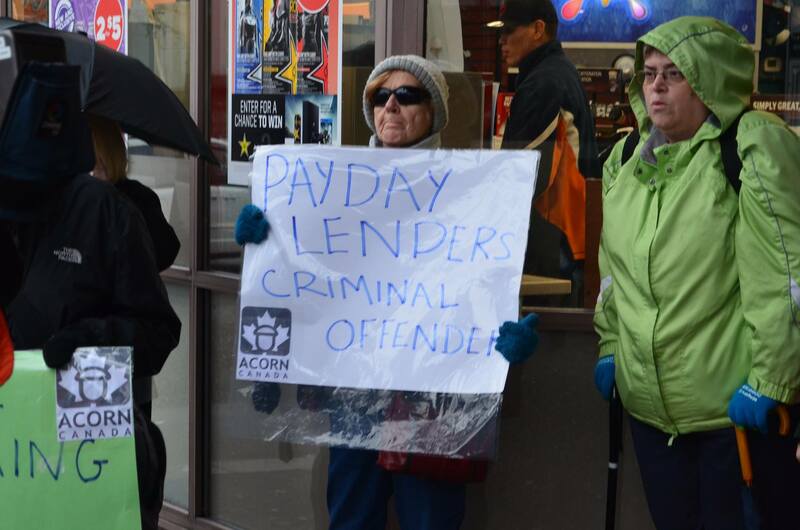 We are happy that the BC Government is taking the issue of predatory lending seriously and hope they will also increase protections against other types of high-interest lending too.” Tabitha Naismith, BC ACORN Leader. In addition to payday lenders payday lenders, many low and moderate income people are forced to use installment lenders, rent to own lenders and car title lenders. TransUnion has indicated that installment loan debt is growing faster than any other type of debt in Canada. Installment lenders charge up to 60 per cent Annual Percentage Rate (APR). ACORN’s 2016 Fair Banking survey of 270 ACORN members across the country found that the majority of respondents who use high-interest lending services were forced to do so out of necessity. The reasons that people turn to alternative lenders include: no overdraft protection with their bank, no access to a credit card, or the location of the alternative lender. The survey also found that 30% of respondents used high-interest alternative lenders, such as payday lenders to pay for food, 17% for housing, 16% for bills, and 10% for poverty in general. Tighten regulations on emerging alternative, high-interest lending products (installment loans, car title loans, rent to own, etc). The next step in our Fair Fees campaign will include calling on the Federal Government to take consumer protection within financial services seriously.